A south-facing roof over the aircraft hangar made an ideal location for the 7.84 kW photovoltaic system at the Airport House. The size of the array was based on actual power consumption. One of our criteria for our house design was to plan for a photovoltaic (PV) system. That meant having an unobstructed south-facing section of roof. With an attached hangar, there is no shortage of roof. It also helps that the south-facing roof is in the back, so the neighbors are less likely to be bothered. 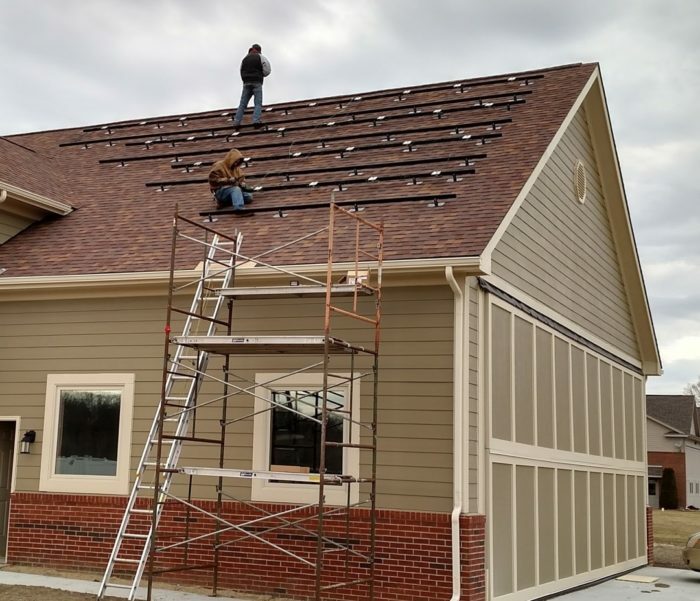 Although we always planned to install solar at some point, the “when” was not clear. For one thing, our finances were a bit stretched when we moved in. The price of solar panels is dropping steadily, which argued in favor of waiting. 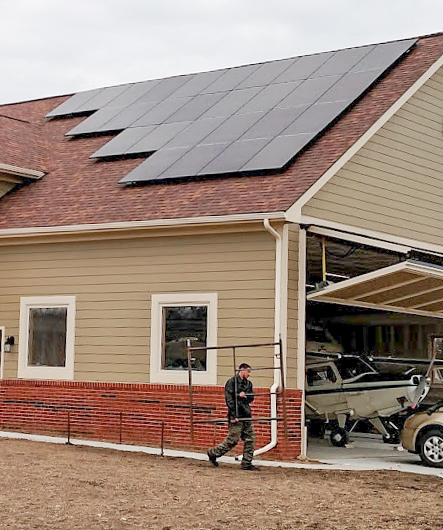 When we moved in, Michigan’s rules for net metering were unclear, with proposals to replace or change net metering under debate in the legislature. This spring, a few things fell into place. The legislature passed new legislation that clarified the rules — somewhat. Projects completed in the next year are expected to be grandfathered under the current net metering rules for 10 years. Although it is still unclear what the rules will be for future projects, it is pretty certain they will be less favorable. A little research revealed that solar projects could be financed under a program called Michigan Saves. We decided to pull the trigger. Our PV array includes 28 Suniva panels [according to published reports, the company has since filed for Chapter 11 bankruptcy]. Each is rated at 280 watts, for a total of 7.84 kW. 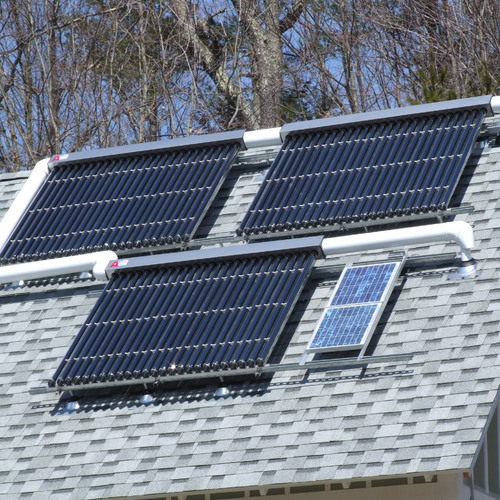 The system was installed by Homeland Solar. The installer sized the system based on our electric bills since we moved in last September. We reduced the size a bit from their estimate because we really do expect to do better on electric usage in the future. For aesthetic reasons, we decided to go with the all black panels even though they produce slightly less power per panel than the silver panels. The first step was to set up scaffolding to safely get up on the roof. Then, the support rails are attached to the roof. After the rails are in place, panels are installed. DC wires run from the panels on the hangar roof, through the hangar attic and the hangar, into the basement. The Solar Edge 7.6 kW inverter is installed in the utility room. Although the inverter is a few feet away from the electrical panel, the AC wiring cannot take the direct route. The utility requires an exterior shut-off switch near the electric meter. In most homes, the electric meter is close to the electrical panel, but not in ours. Fortunately, in anticipation of eventually installing a generator, we had the foresight to install a conduit from the utility room to the end of the house with the meter. 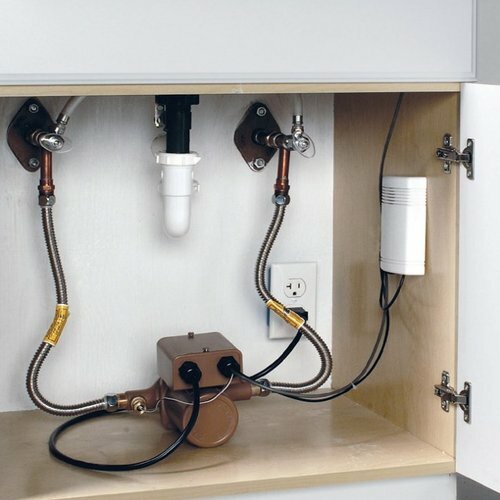 The installers were able to pull three sets of wires through the conduit: one from the inverter to the shutoff switch, one from the shutoff switch to the electrical panel, and one for the eventual natural gas standby generator. The installed cost came out to $2.55 per watt ($1.79 after the 30% tax credit). Our monthly payments under the Michigan Saves loan will be a little bit more than the expected reduction in our electric bill, so the project is not quite cash flow positive in the first year. If electric prices go up, we will be ahead. In 10 years, the loan will be paid off, so we will be saving money even if the net metering terms are not as favorable. In an earlier post, I discussed a number of options to provide space heating and cooling. One of those options was an integrated system that provided both space heating and hot water. Ultimately, that wasn’t what we decided to do, so I needed to select a water heater. This choice has several aspects: what fuel to use, storage tank or tankless, whether or not to circulate the water, and whether to include heat recovery. The criteria include: initial cost, operating cost, and the likelihood of running out of hot water. What fuel for the water heater? The realistic choices are electricity and natural gas. When natural gas is available, oil or propane offer no advantages. Electric water heaters tend to be cheaper to install but more expensive to operate. Since natural gas involves combustion, provisions must be made to supply combustion air and to vent the exhaust. The 7.84 kW photovoltaic array includes 28 panels. The system was installed for $2.55 per watt ($1.79 per watt after the 30% federal tax credit). The cheapest type to install is an atmospherically vented model. These draw combustion air from the room and rely on the temperature of the exhaust gas to draw the exhaust up a chimney. This type is not compatible with a high degree of air sealing. In a well-sealed house, the kitchen fan or dryer can lower the pressure in the house enough to reverse the flow in the chimney and draw exhaust into the house. The next step up the expense scale is a power-vented water heater. An electric fan propels the exhaust products out of the house. Inside air is still used for combustion. The most expensive type is a powered direct vent which draws outside air for combustion and sends the exhaust outside. 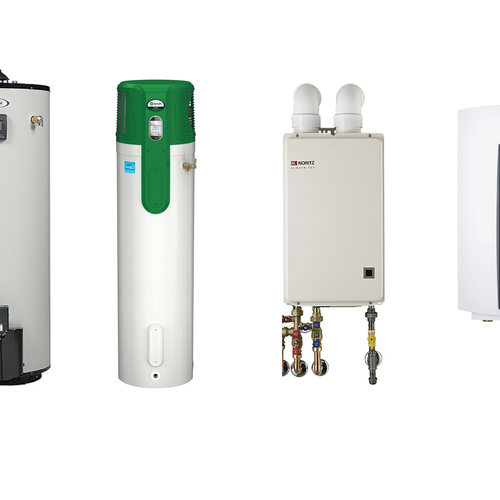 Storage type water heaters heat a tank full of water up to a setpoint temperature and keep it hot. Some heat is continuously lost from the storage tank. If too many people take showers in a row, the water heater cannot keep up and will eventually deliver cold water. The usual solution to that is to increase the size, say from 50 gallons to 80 gallons. Larger units cost more to install and have higher storage losses. Tankless water heaters, on the other hand, heat the water as it is drawn. Tankless water heaters must have larger BTU/h capacities in order to keep up with the maximum water flow rate. Sometimes, that requires upgraded natural gas or electric service from the utility. They never run out of hot water no matter how many people shower in a row. Tankless heaters have been known to have trouble regulating the water temperature when the flow rate is low. When you turn on the hot water, the water that had been sitting in the pipe comes out. If it has been there awhile, it is cold. You have to wait for hot water to start flowing. One solution to this problem is to circulate the hot water so that the hot water pipe is constantly full of hot water. Of course, that hot water in the pipes is constantly losing heat, increasing the energy the water heater uses. This can be alleviated somewhat by only periodically circulating the water, such as when someone turns a light switch on in a bathroom. Drainwater heat recovery (DWHR) systems, such as Power-Pipe or GFX, are heat exchangers that recover some of the heat that is left in the drain water. They are most effective for showering. The recovered heat preheats the cold water entering the water heater and the cold water feed to a shower. In addition to reducing energy use, these systems increase the number of showers before a storage type water heater runs cold. 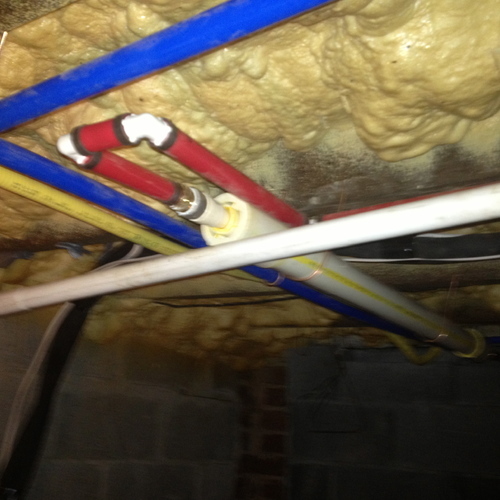 These systems are installed in a vertical drain pipe. After much debate, I decided on a 50-gallon GE Geospring heat-pump water heater. This unit uses an electric heat pump to transfer heat from the interior air into the water. It operates with a coefficient of performance of about 3, meaning that it only uses one watt of electric power for every three watts of heat that goes into the water. The other two watts come out of the interior air. In the winter, that increases the natural gas consumption of the furnace. In the summer, it reduces the electricity use of the air conditioner. Although it costs much less to operate than a regular electric water heater, it still costs a little more to operate than a gas water heater at current prices. My major motivation for this choice was to avoid having another combustion appliance in the house. Some people have complained that heat-pump water heaters are noisy and take too long to recover. I decided that I was willing to take those risks. Having finally made this decision, I arrived at the house one day and found the plumbing subcontractor busily installing a power-vented natural gas water heater. I didn’t expect water heater installation for several more weeks. After a few phone calls, things were straightened out: the gas-fired water heater was removed and the heat-pump water heater was installed. I decided against any kind of circulation system. The only fixtures that are very far from the water heater are in the guest bathroom, which I expect will be rarely used. Although the drain for the master bathroom is suitable for DWHR, drains from the other two showers are not. (The shower in the basement does not have a vertical section. The shower in the guest room is used too infrequently to justify DWHR.) I am pretty sure that the plumbers had never encountered a DWHR system (they had never seen a heat-pump water heater). I decided that this was not the occasion to make the builders do something else completely new to them. The drain for the master bedroom is in an accessible location in the utility room, so the option remains open if I decide to take it on as a DIY project at some point. The finished panel install looks really good on the roof. Who are those shifty guys in their hoodies without fall protection? Lucky OSHA wasn't around!